Eco-Files is a brand new "edutainment" tv series created by Vincent Cericola and Blaze Kelly Coyle. Episodes 1 & 2 were produced by Silver Phoenix Entertainment and Valenti Vision Films! ​children and adults of all ages! 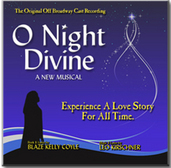 "Experience a love story for all time"... O Night Divine is a full-scale musical based upon the classic biblical story of The Nativity, featuring the songs "Amaze," "We'll Get By", "What Gifts? ","Mathias' Inn", "Chosen","Now And Always In My Heart", "Then You Came In" and "King of Kings". Celebrate the season with Mary and Joseph, a trio of tap dancing Wise Men, an evil King, and a whole cast of colorful characters. O Night Divine is sure to become a new annual holiday tradition the whole family and people of all faiths will thoroughly enjoy!